There are few people who know and understand diamonds and precious stones, with the same depth and intimacy as a trained and experienced jeweller. For over 44 years Dimitries Jewellers has been providing fine jewellery services to the Canberra and Queanbeyan markets with an unwavering goal to provide premium jewellery, superior service, and genuine value all year round. 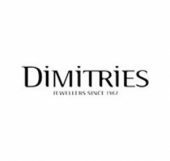 Dimitries Jewellers are trained professionals specialising in diamond jewellery, gold and silver jewellery, engagement rings, and precious and semi precious stones. It’s their extensive training, breadth of experience and access to world gem centres that make it so much easier for you to find the best possible value in exciting, unique and quality jewellery. Dimitries Jewellers understands that each piece of jewellery tells a story. An item of jewellery can be a representation of your personality and style, a moment in time, or an event that should be celebrated and remembered for years to come.